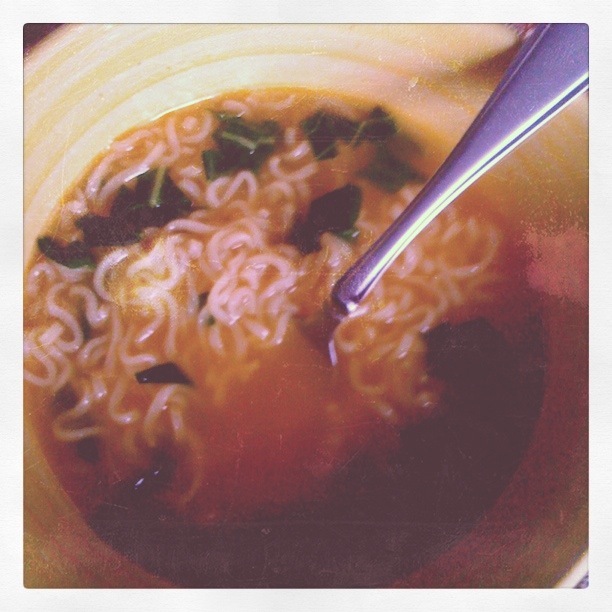 Faux Pho – Writer. Editor. Storyteller. The other day I found myself sitting at my grandmother’s house wondering what I was going to have for dinner. My choices were limited. I could have cereal, wait to unfreeze my tomato sauce and make spaghetti, or figure out what I could make from the garden. That basically meant a salad, or…uh…not much else. I could stop at Moe’s and grab a burrito, or at the store for something more substantial. Then I thought about the bok choi and the Thai basil. “Nana, do you have any Ramen?” I asked. Of course, she did. I stuck a package in my purse and headed home. I chopped up the bok choi, and tossed it into the pot along with the basil and splash or two of sriracha. The results? DELICIOUS.